Giovanni Fernandez, Ph.D., has been appointed executive director of Graduate Programs in Stetson University’s School of Business Administration. The announcement was made by Dean Neal P. Mero, Ph.D. The appointment is part of Stetson’s ongoing efforts to build on traditional strengths in undergraduate business programs to then create distinctive graduate programs that prepare graduates to meet the challenges of leading business organizations in an increasingly complex global marketplace. 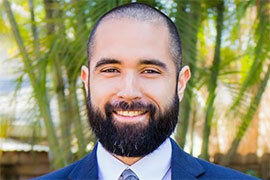 Fernandez came to Stetson in 2012 from Florida International University in Miami, where he was born and raised. He was drawn to Stetson because of the university’s tradition, reputation and low faculty-to-student ratio. Fernandez’s love of finance began at a young age. His father taught finance for 36 years while also being a financial advisor. Fernandez chose to follow in both areas and now leads Stetson’s financial planning finance concentration as well as Graduate Programs. Next year, Stetson will introduce new MBA and Master of Accountancy graduate programs to meet both the needs of students seeking a residential approach to graduate education and those who prefer to leverage technology. In his new position, Fernandez will oversee the creation of those graduate programs by integrating traditional and technological methods and developing teaching practices to ensure the success of the programs and its students. He has been tasked with enhancing the accessibility of Stetson graduate programs for prospective students while maintaining the quality standard that the School of Business Administration is recognized for, according to Mero. Fernandez is responsible for supervising all business graduate programs and staff across three Stetson campuses in DeLand, Celebration and Gulfport. This includes Stetson’s Executive MBA program, which offers an immersive learning experience for professionals ready to prepare for advanced executive leadership roles. “I am excited about the skills and energy Giovanni will bring to the development and expansion of our graduate programs,” Mero concluded.